For an acoustic guitar to work properly it is very important that the gap between the strings and the frets (called the ‘action’) is set correctly. If the strings are too close, they will rattle against the metal frets when they’re played and the guitar will sound horrible. 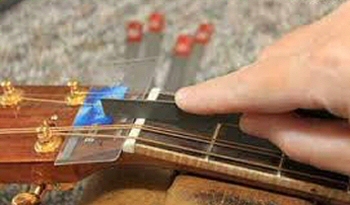 If the strings are too far from the frets, the player will have to push down much harder on the strings, making the guitar uncomfortable to play, and often bending the notes out of tune. To get the right gap between the strings and the frets all the way along the guitar’s neck, several fine adjustments have to be made – these adjustments are known as the ‘set up’. To set up an acoustic guitar properly requires specialist tools, accurate measurements, and expert knowledge – so it needs to be done by an experienced luthier. Setting up an acoustic guitar properly takes skill and time, but factory set-ups (particularly on budget instruments) are done as quickly as possible, to keep labour costs down. And ensure that the strings don’t buzz they deliberately set the action too high. If you bought your new guitar from a reputable guitar shop they should have adjusted it before putting it on their rack, but if you bought online or from a big distributor your new guitar will almost certainly need setting up to bring out its full potential. Wood changes with time. Necks bend slightly, bellies sink. To keep your guitar playing at its best it is worth getting the setup checked every year or so. And if you change string gauges the action will certainly need to be adjusted. If you find the action is gradually getting higher and higher it is often a sign that the guitar has suffered some sort of structural damage – either a snapped truss rod or a loose bar or block inside. You should get it looked at by a luthier as soon as possible, before things get worse. If your frets are worn or uneven the action has to be set higher to prevent buzzing on individual frets. Therefore if your frets are bad it makes sense to get them dressed or replaced before setting up. I will always inspect the frets and advise you if I think they need work before proceeding. When a guitar comes in for setup, the first stage is to clean and oil the fingerboard, check the condition of the frets and fit new strings. The next stage is to check the neck relief. 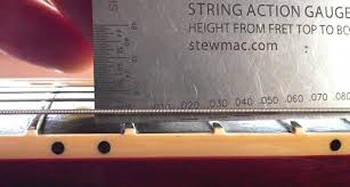 To keep the action as low as possible the fingerboard shouldn’t be completely flat along its length, but very slightly concave, to allow for the fact that when the strings vibrate they don’t stay straight, but swing in a curve, like a skipping rope. Neck relief is adjusted by tightening or loosening the truss rod. If you want to check the relief on your own neck, put a capo between the nut and first fret, then fret each string at the 14th fret and check the gap between the string and 6th fret. It should be .010″ (you can measure it with car mechanics’ feeler gauges) That 0.010″ measurement is the same for all guitars – some other measurements can vary depending on the type of guitar and playing style, but neck relief is dictated by the laws of physics. After that the nut height is checked. On new guitars the nut is almost always too high, so the string slots are carefully filed down using a set of nut files which are the same width as the strings. On older guitars the string slots eventually wear down so that they are too low. In this case either the slots can be filled and then re-cut, or a new nut can be made from bone or plastic. If you want to check the nut height of your guitar, put a capo between the 2nd and 3rd frets, then look very carefully at the gap between the string and first fret – there should be the very slightest of gaps (about 0.002″). If you can see is an obvious gap, and the string bends as you push it down onto the fret, the nut is too high, and will be making it hard to fret the strings. If the string is actually touching the 1st fret the nut is too low, and it will probably buzz when you play the open string. If you are not sure if the string is touching the fret try lightly tapping the string with your finger tip. If there is a slight gap you will hear it click as it hits the fret. If it’s already resting on the fret you won’t. Once the nut height is correct the saddle height can be adjusted. The aim is to get the action as low as possible without the strings buzzing on the frets when you play normally. Adjustment is made by filing the saddle to lower it, or either adding shims below it or making a new saddle to raise the action. The correct action height does depend to some extent on string gauges and playing style. To check the height play one string repeatedly, gradually playing harder until you hear it start to buzz. That should occur when you are playing about 20% harder than you would ever do in normal playing. If it buzzes within the normal playing range the action is too low, if it never buzzes, it is too high. If you are not sure you can also measure the string heights. For the vast majority of players, with a capo on the first fret the gap between the low E string and 13th fret should be 0.90″ and between the high E and 13th fret 0.070″ (use those motor mechanics feeler gauges again! ), but if you use ultra light strings, or play hard using thumb and finger picks or a heavy flat pick, then the saddle may need to be set very slightly higher. The final stage is to check the intonation (how well the high frets are in tune with the open strings). Thankfully these days most guitars are accurately built and need no adjustment, the only time it becomes necessary is if you are using string gauges substantially different to what the guitar was designed for. If the intonation is only slightly out it can be corrected by profiling the saddle so that the string touches it further forward or back, but in extreme cases it can mean modifying the bridge to move the saddle. To check your own intonation, play the octave harmonic by plucking the open string then very lightly touching it exactly over the 12th fret, and compare that with the note you get playing the string fretted at the 12th. They should be exactly the same pitch. You can also perform a rough check by comparing the open string and 12th fret using an electronic tuner. Once all that is done, your guitar should be a joy to play!